Many of you took interest in my last post "3 easy ways to make money on Instagram", and I got a ton of questions on the Heartbeat program I use. Some of you jumped on the bandwagon right after I made the post, but I'm sure others of you were a little hesitant because making money for posting on Instagram seems too good to be true. However, I am here to tell you that it's not. It is 100% possible to get paid to post pictures on Instagram. Heartbeat is a website that allows you to sign up for an account and start earning money from campaigns you promote on Instagram. It is super easy to sign up for an account, and takes less than 15 minutes to get everything set up. 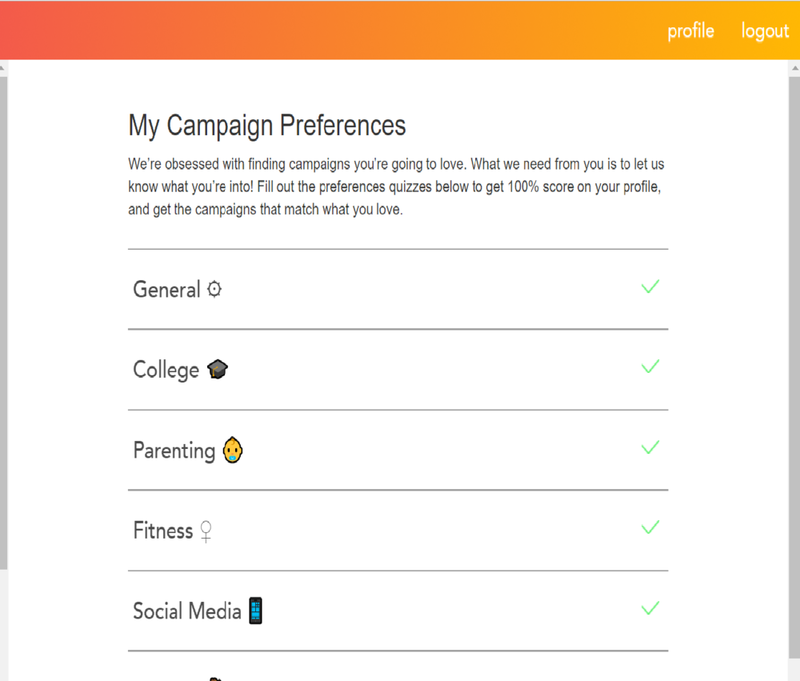 Heartbeat has you fill out mini quizzes to find out more about your interests so they can send offers that match your niche and what you're most interested in. If you're still not convinced, every ambassador for HeartBeat will get a chance to redeem exclusive discount codes to get offered products at a reduced price! So even if you don't qualify for the campaign, you can still get the same discounted offers. HeartBeat will pay you a set rate for each of the posts you make. Sometimes the campaign is in exchange for a free product, so just make sure you read the details completely. Although usually it'll say flat out at the beginning if it's paid or not, so you don't waste your time. My personal rate per post is $10. There are multiple ways to increase your rate amount, so be on the look out for those opportunities. The campaigns I have completed have paid me about a week after completing the campaign, and they're always on top of their payments! I had a few questions and their team got back to me super fast. Keep in mind the only way to get paid right now from my understanding (as of 10/5/17) is through PayPal. So make sure you have that account set up before hand so you can get your payments! In addition to payments from the campaigns, you can also get payments from referring your friends and readers! They pay you $1 per sign up after the person you referred completes their first campaign! It's a win-win because you get a bonus, and they just made money for posting on Instagram. This isn't going to get you rich, but I can tell you it has helped out a lot when I've needed extra spending money, or if I have a credit card minimum payment due *COUGH*. PLUS all you're doing is posting pictures related to the campaign on your page. If you're worried about it being spammy, most campaigns only require you to keep the post up for 72 hours before deleting. Make sure you read the rules of the campaign though, or you'll lose out on the payment. 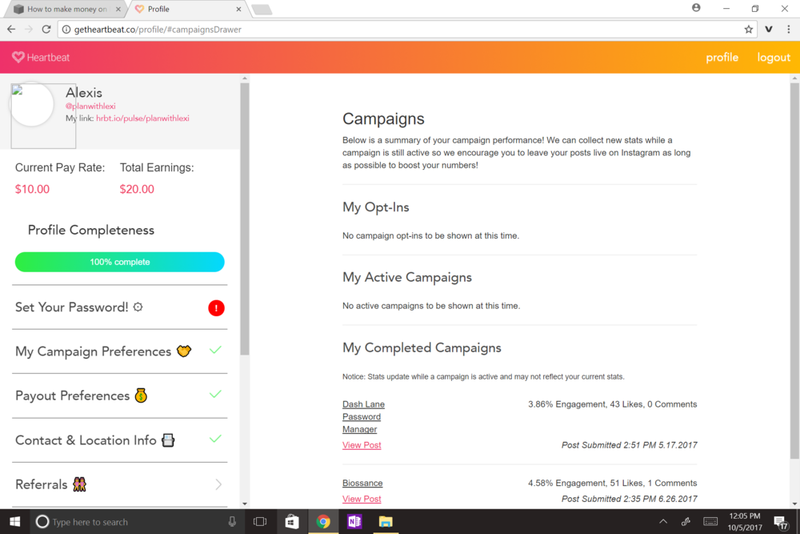 I have successfully completed two campaigns myself, and I can truly say this website is legit. No scams, actual pay, and plenty of opportunities to sign up. I've turned down more than I've accepted because I want it to relate to my audience. However, I get multiple emails a month from them asking to sign up for campaigns I qualify for. if you want to earn money for posting on Instagram too, then click the button below or click HERE to sign up ! Should you use a paper planner ?